Details of industrial and commercial narrow gauge railways across Europe. These pages display the list of countries that have featured railways on the site. Examples of both operational, and ceased lines are shown. Further railways will get added to these pages as time permits. If you have photographs you wish to share, please send at least 4 photos, and some supporting background text and they can be added. 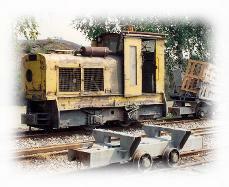 For some countries there is an industrial railway listing, detailing all the current ng industrial railways.